The Louvre remained reticent about whether it had lost the Mona Lisa at all. The only documents about the painting during World War II attest to its having been crated up on August 27, 1939, and sent with other French national treasures to a series of five chateaux, for safe-keeping—theoretically just ahead of the advance of the Nazis south through France, though the invaders quickly overtook the entire country. Can you spot the original? 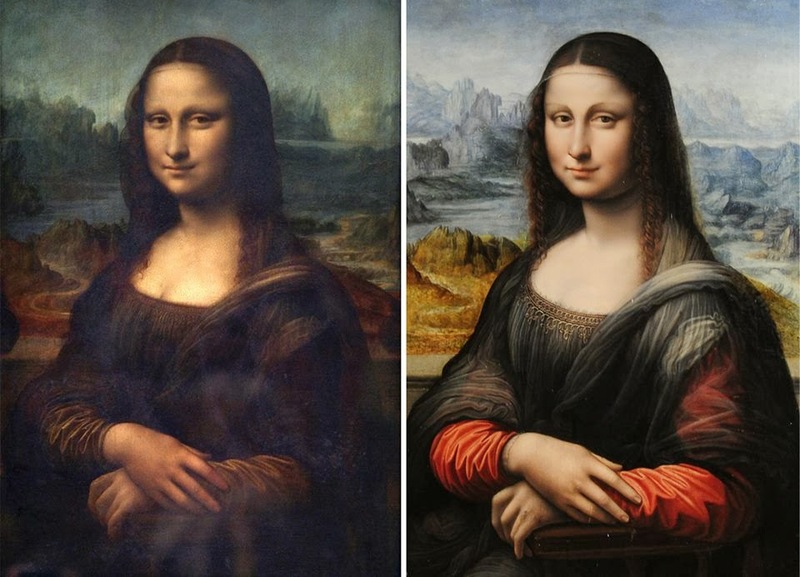 The portrait on the left is Leonardo da Vinci's original, the painting on the right is the 16th century copy. Our Fact of the Day! New York City from a plane at night! Misty morning in Bagan, Myanmar! Razor Thin Home in Japan! Bill Gates' living room! Amazing! Highest human made rock climbing, Netherlands! Fairy made of the parts of a hand-watch! The edge of Earth - Bunda Cliffs in Australia! Stars in the sky > people on the Planet Earth! Water spout at Liguria, Italy! It looks cool! A Beast on land, a Beast in the water too! When penguins fall in love. Ceiling Art used in a smoking room! wow! Custom-built Henderson motorcycle from the 30's! What is the standing arch in Nagasaki made of? What Yellowstone looks like during winter! Cool! This is Quokka, the happiest animal in the World! 400 year old tree Angel Oak in South Carolina! This tree's roots grew with the floor pattern! Amazing storm clouds in Nebraska! Mountain Rushmore from the Canadian side! Road in Norway through the Atlantic Ocean! Volcano eruption, seen from space! Atlantis Resort, Paradise Island, Bahamas! It has happened to me a thousand times! Trampoline bridge in Paris, France! Morning clouds over Dubai, UAE! Cathedral made from 55,000 LED's! Awesome view! This is how pineapples grow. This is Mexico City! wow!